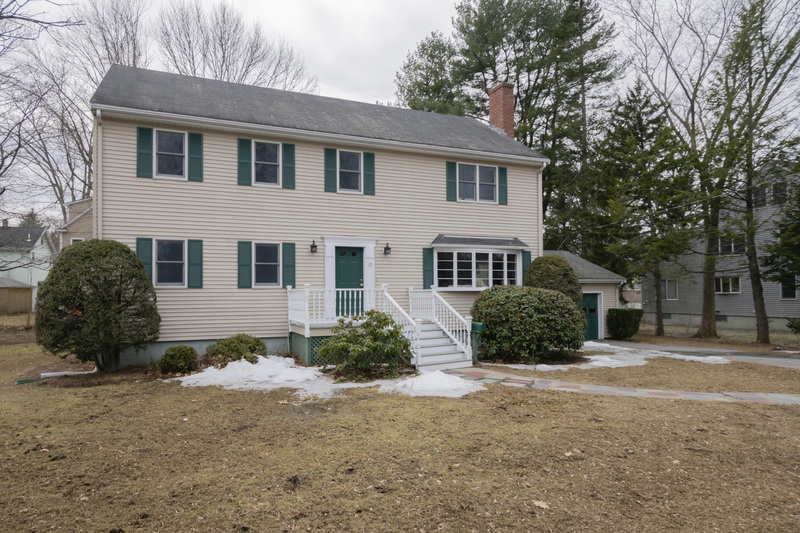 Move right in to this meticulously-maintained Colonial, perfectly situated in a popular neighborhood on a quiet, dead end street convenient to the town center and the Minuteman Bike Path. The inviting, two-story foyer welcomes you into the spacious formal living room as gleaming hardwood floors and abundant natural light begin to flow throughout the home’s immaculate interior. Impress your guests in the open concept family and dining rooms, perfect for effortless entertaining. Sunlight streams through the large bay window in the family room as a wood burning fireplace provides a warm and cozy place to gather on chilly nights. A seamless transition opens to the formal dining room as the shining hardwood floors continue to span the beautiful rooms. The chef ’s culinary skills are guaranteed to shine in the updated kitchen full of modern flair with granite counters, stylish white cabinetry, brushed nickel hardware, and an informal dining area. A sunny window over the sink offers delightful views of the spacious and level backyard beyond, perfect for outdoor relaxation and entertaining. The rear hallway off the kitchen provides access to the lower level, an exterior door to the backyard, and an impressive private office. The office is beautifully designed with a large picture window, hardwood floors, and barnboard walls for a unique feel. The first level continues with the first of four spacious bedrooms. This large, light-filled bedroom offers comfort and style with gleaming hardwood floors and an ample double closet for storage. The first level bathroom is easily accessible from the bedroom and is newly renovated with a pedestal sink, a tiled tub with shower, and a ceramic tile floor. This thoughtfully designed home offers a full bathroom on every level to easily accommodate the whole family. A staircase from the front foyer leads to the large landing area of the second level as the home continues to deliver with the spacious master suite, two more family bedrooms, and a family bathroom. The generous family bedrooms on the second level are light-filled with plush carpeting, recessed lighting, and large double closets. The family bathroom offers a dual sink vanity, modern white cabinetry, and a tiled tub with shower. The master suite is full of natural light with a sweeping cathedral ceiling, ceiling fan, a sunny double window, plush carpeting, and a large walk-in closet. The master bathroom stuns in neutral tones with a dual sink vanity, stylish white cabinetry, an over-sized tiled shower with dual shower heads, and ceramic tiled floor. The walkout lower level continues to deliver with a huge finished space featuring brand new flooring and is perfect for use as a second family room, playroom, exercise area, or whatever you desire. Another full bathroom offers convenience with the laundry area, a tub with shower, and an updated vanity. The lower level also offers abundant storage space to efficiently organize all your family’s hobbies and activities. Perfectly situated to enjoy all that Lexington has to offer, this home is only a mile to the town center and a short distance to major highway routes. Take advantage of a short distance to the Minuteman Bike Path, the Lexington Golf Club, and shopping/dining along nearby Bedford Street. Be a part of a highly renowned school system and immerse yourself in the town’s rich history. What a wonderful opportunity to live in one of Lexington’s finest neighborhoods.